As a young mother, I was on the lookout for fun and friendly activities for my kid. I went through most toys, shakers and I must say I felt that I got it right when I got a best baby jumper. With time I learned that baby’s love moving and jumping around surrounded by various activities and the jumper became a must have in my home, for all my kids, and to-date is my go-to baby shower gift! Well, of course, I was entirely speculative at first but seeing her smile and giggle each time she got onto the jumper was something I wanted to see, and have her enjoy, time and time again. If you’re looking for something fun and development-friendly for your young one, a baby jumper is the answer and here’s why. Why You Need The Best Baby Jumper? Baby jumpers are typically seats attached to elastic straps. The child is placed into the seat and pushes themselves upwards with their legs and toes, hence the bouncy and jumping effect. So why get this jumper? The bouncing keeps them intrigued and having fun which in the end helps get rid of all that excess baby energy that keeps them up all night. With the jumper, you can expect your child to sleep much more soundly. The jumper utilizes your baby’s’ toes and legs to push themselves up, this, in turn, helps in the development of their leg muscles. Baby jumpers let your child work off their excess energy safely and securely so you won’t have to worry. With your baby well distracted or sleeping soundly, you can catch a break, take a breather and escape from those sleepless nights too. There’s variety of baby jumpers available on the market that could have you hunting for the perfect one for quite some time. This article has all you need to know about best baby jumpers and reviews the best jumpers currently available. The best baby jumper review commences with this Bumbly Evenflo ExerSaucer Door Jumper. This door jumper fits the typical 3-6 inch thick doorways and is to be securely fixed onto at least 0.5-inch wide door trims. As all baby jumpers do, this jumper contributes to a proactive and fun activity for your child. It is designed with a framed seat that surrounds your baby while comfortably holding them in the jumper. The seat can be detached from the frame thus easy to wash. Safety is enhanced by the fully enclosed spring keeping your baby safe from lodging their fingers in the spring. This also prevents dirt from accumulating in the spring. This unit has adjustable straps that are adjustable to your baby’s increasing height and weight. It is small and portable hence easily stored and conveyed as you travel or switching jumper positioning. It is ideal for use by babies from four months old to walking age and has a maximum weight restriction of 24 pounds. Only place your child in a jumper if they can hold their head up unassisted. This jumper, out of the box, requires assembly. However, this is easily done, and no tools are required. 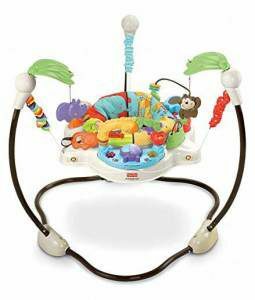 With a vast array of lights, music and sounds, the Fisher-Price Luv U Zoo Jumperoo couldn’t miss topping this review list. This jumper is designed to encourage your baby’s movements by rewarding their jumping with the sounds and lights. What fun! As a free-standing jumper no doorway is needed to accentuate its stability. It is made out of high-quality metal, plastic and polyester parts that make this unit durable and reliable to handle your baby’s jumping motions. 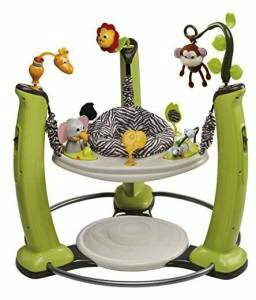 This jumper comes accessorized with zoo-themed toys such as giraffes, spinning alligators, bat-at-gorilla, elephant mirror with spinning beads, hippo roller ball among others that keep your baby entertained while developing their motor skill when in the jumper. The seat is capable of a 360-degree spin that allows your baby to discover more toys and have fun while facing all directions. This seat is also adjustable to 3 different heights that should accommodate your child’s growth. The soft spring covers also keep their small fingers away from the spring. This unit has a compact design, and the tubes can be detached from the base making it easy to store and convey respectively. It has a maximum weight restriction of 11.3 Kgs and height restriction of 81cm, so make sure your baby falls within these limits. 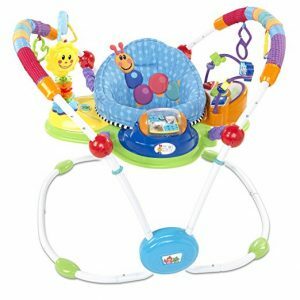 With a total of 58 fun activities for your baby, the Evenflo ExerSaucer Jungle Quest themed Jump and Learn Jumper, came in third. These toys are age appropriate, developed hand in hand with the Child Development Institute making them ideal for your child’s entertainment and skill development. They are not only entertaining but also help your baby develop their motor skills. 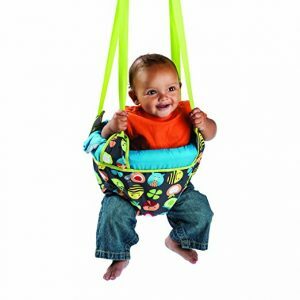 The overall jumping, rocking and spinning activity this bouncer provides aids in the leg, back and neck development for your child. This jumper is designed with a unique balance bounce base that provides a soft landing pad for your baby, enhancing their coordination, stability while encouraging core strength building. It can also be adjusted to three heights to accommodate your child’s growth. The detachable and machine washable seat pad make it convenient for cleaning purposes. The seat also comes incorporated with sounds and lights ideal for baby entertainment and encourages their movement. It requires 6AAA batteries to work and has a battery life of 2.25 hours. If you are looking for a stable, secure and best baby jumper suitable for your 3-month to walking age child, then you can check out this fantastic Jolly Jumper on a Stand for Rockers. It can be put into use as soon as your baby can hold their head up and supports a weight of up to 13kgs. Its design incorporates a 52 inches high frame and floor footprint size of 50 by 43 inches, and this should be enough rocking and jumping space for your young one. This jumper is versatile and can be used either outdoors or indoors. The saddle is scientifically designed to provide a firm back support for your baby, encouraging upright and correct posture while in the jumper. Stability is enhanced by the sturdy frame and non-slip feet ensuring your child’s safety. The jumping and rocking movements improve your baby’s balance, coordination, and muscle strengthening. As a stationary jumper, this jumper doesn’t come with toys or other accessories, and this makes it a suitable baby exerciser since it discourages distractions by toys, etc. This jumper provides a wide range of height adjustment enabled by a chain from the base, and it can even accommodate 3 to 11 months growth. It has an easy setup process. Another doorway jumper tops our list, the Graco Doorway Bumper Jumper, Little Jungle. 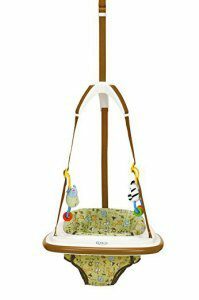 It is designed with a strong bounce string that provides your baby with an incredible jumping action. The hidden safety cord accentuates the jumping and leg action too. This jumper is very portable and can be easily conveyed while traveling or when changing the jumper’s positioning room to room. It is designed with a no-mark clamp that ensures no marks or damages are left along your doorway frames due to jumper usage. The high-back seat is removable and machine washable, also having been made with nylon it can also be wiped to save on time. Non-twist strap and plastic dome prevent entanglement, and so you can quickly place or remove your baby from this jumper. 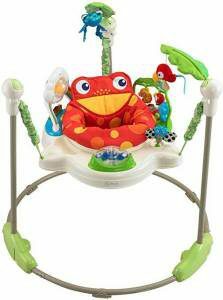 A jumper ideal for a baby able to hold their head up and cant climb out or walk yet is the Fisher-Price Rainforest Jumperoo. This is a freestanding jumper that doesn’t require to be attached to doorways. It has a rainforest theme that incorporates designs such as two soft leaves from the frame forming a canopy of soft toys encouraging a bat-at play for your child. It has a maximum weight and height of 25lbs and 81cm respectively. The jumper rewards your baby’s jumps with sounds, light and music. The light-up musical piano always has my baby bouncing to it. 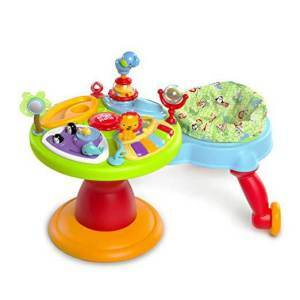 The rotating seat allows your baby to have fun and move around when facing all directions. Springs are softly covered ensuring the small fingers don’t get pinched. This jumper is also height adjustable to a maximum of three positions for comfort maintenance even as your baby grows. This jumper has a straightforward take-down process and can be easily folded during movement from room to room while the ability of the frame to pivot to a nested position allows it to be tucked away in storage. The seat pad is machine washable and dryer safe making it easy to clean. Stability is enhanced by the sturdy and durable frame that can also be easily assembled. This unit requires 3AA batteries to function. The Bright Starts Around We Go 3-in-1 is a other baby jumper that will keep your kid challenged and entertained for their entire toddler life. It’s an award-winning activity center that you’ll love watching your baby take their first steps in. and as much as you’ll love it, so will your baby love it. It comes with such a unique design that it acts as a walker and an entertainer at the same time. The structure comes designed from metal, plastic and polymer materials. The metal structure provides a unique and stable station where your kid can play all day long without fears of him/her falling over, while the polymer and plastic materials add to the strength of the jumper. It also ranks among the few jumpers that features a complete music station with a wide range of attractive sounds to keep you baby entertained. These sounds include melodies, piano, and silly sounds. Because of its height adjustable capabilities, this jumper will grow with your kid; that is, you can easily adjust its height to match that of your growing kid and allow them cot continue enjoy the fun! As your baby grow, they might develop interest for other toys. And this jumper come with enough room where you can attach the extra toys for them. Being a machine washable jumper, you can bet that it’s completely easy to clean and maintain. And because it collapses, you’ll have an easy time storing it or transporting it for use in different areas. Without a single doubt, your kids will be in for real fun when you buy them this Baby Einstein Activity Jumper Special Edition, Neighborhood Friends. They’ll be get attracted to and get a chance to explore all the outstanding features that come with this jumper, alongside their Baby Einstein friends. The special edition comes with a total of over 12 activities which will keep your kid busy for the whole day. Needless to say, these will encourage your kids to do a 30 degrees swiveling around their chair and get to enjoy all the fun activities aligned for them. The electronic piano will be a center of attraction for your kid, no doubt! It comes with attractive lights, easy to sue volume controls, and up to three modes (language discovery (in English/French/Spanish), key piano tones, and classical melodies). Other mind-blowing activities that your kid will truly love in this jumper include a spinning rattle drum, spinning frog bead chaser, and so on. Unlike the other cheaply designed models, this jumper provides you with extra link loops where you can easily attach the favorite toys for your kid. The securely supported seats ensures total safety for your kid. Plus it comes with soft fabric padding the ultimate comfort. With up to five height settings, you can rest assured that this jumper will grow with your little one. This jumper is commonly seen as a safe alternative to baby walker use. 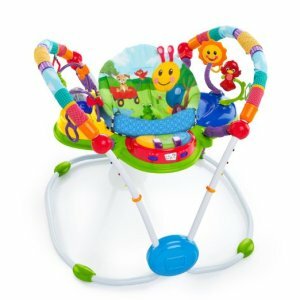 The Evenflo Exersaucer Bounce and Learn Sweet Tea, Party comes with a variety of age-appropriate toys that aid in developing various motor skills for your baby. This particular design comes with different sounds, lights, music and emulates a girly tea party theme. This unit allows height adjustment to a maximum of three positions allowing the jumper to grow with your baby. It is a free-standing jumper and doesn’t require doorframes since it provides a stable and secure fun environment for your child by itself. With this jumper, you baby can bounce, spin and rock and this, in turn, develops their neck, back, legs and motor skills via the physical exercise. The seat is removable and machine washable making it easy for you to clean especially after those nappy leaks. In general, this jumper packs in 8 activities that are designed to aid in visual and motor development, object exploration and permeance and also in hand-eye coordination for your child. With over 12 activities, the ​Baby Einstein Activity Jumper Special Edition, Neighborhood Friends concludes this jumper review. It is ideal for babies at least 4 months old. Safety is enhanced by the 4 non-skid feet, firmly placing the jumper. This jumper has a 360-degree rotation seat allowing endless fun and all-​access to toys in whichever direction your baby faces. Be assured of your baby’s comfort and support when they’re placed in the high back seat of this jumper. This jumper is adjustable to 5 height settings, which is more than other jumpers provide, allowing it to grow with your baby. 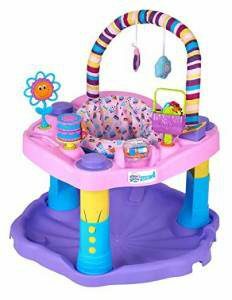 It is designed with a volume controlled light up piano and ​4 play modes that keep your child entertained while they bounce. Each baby jumper comes with the manufacturer’s maximum weight and height specification. This is an important aspect. The weight specification determines how much weight the jumper can withstand while the height specification stipulates the height your child needs to fall in. Both of these are designed to ensure if your baby can be well supported by the best baby jumper. Make sure you check this specification to keep your baby out of harm’s way. You should opt for a baby jumper with a seat that is can easily removable, washable and even plush padded to increase comfortability for your child. Removable and machine washable seats allow you to easily wash the seats especially after those nappy leaks. Padded seats make the seat more comfortable allowing your child to seat in them for some time. This is a key attribute you may want for your baby jumper seat. As you know, children grow quite fast, and with an adjustable seat, you will not have to worry about buying a new and best baby jumper with each inch they grow. You will be able to maintain your baby’s comfort in the baby jumper as you adjust it to their growth. Opt for a jumper with a higher adjustment level range, these tend to be more convenient. 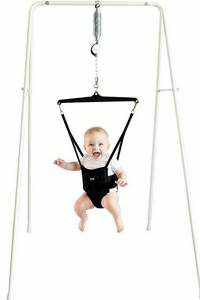 This forms a core foundation for your baby jumper’s operation since it involves the use of elastic straps to both allow the bounce effect and maintain your child’s stability while on the jumper. Usually, one strap may tend to move up-down but also dangerously in right-left sides too, while two strapped jumpers are more stabilizing and only restrict the movement to up-down as designed for the jumpers. Most best baby jumpers are themed and come with a variety of toys, lights and sounds, these aid in accentuating the devices ability to entertain your child. Choose a combination that you feel will truly appeal to them. Baby jumpers need to be quickly moved around and stored. You don’t want it to take too much effort to carry in and out or take too much storage space. A best baby jumper that can be easily folded or disassembled, and takes less storage makes a perfect choice. You can hang on your baby best diaper bag backpack in the jumper. Just like placing your child in any contraption, you should take your time to make sure you use have placed them securely and well in the jumper correctly. Here are a couple of pointers as to how to correctly use the baby jumper. Make sure that before purchasing any baby jumper, your baby meets the manufacturer’s age and weight restrictions. However, note that your baby should be ready for the jumper once they can individually support their head. Also, remember to stop using the jumper as soon as your baby outgrows it. Remove any sharp/blunt edged objects from the vicinity of the baby jumper to make sure your baby doesn’t jump onto them, injuring themselves. Position the jumper in a safe area far away from any pools, stairs or in the vicinity of any potentially harmful movable or tipping objects. Make sure that the positioning area is on the evenly flat ground to enhance stability and avoid tipping over as your baby jumps up and down. Limit the baby jumper use to about 20 minutes throughout the day. Pediatricians insist that the utilization of a baby jumper should not be long-term and that the 20 minutes can be segmented and distributed throughout the day. NOTE: Never leave the room while your baby is still in the baby jumper. 1. Are baby jumpers ideal for infant leg development? There are two different views on this. Most mothers attest that baby jumpers have helped their child’s leg development and teaching them to walk independently. However, others don’t agree, claiming the use of jumpers leads to a delay in walking. This is supported by experts who recommend restricting baby jumper use to only 20 minutes a day. Nevertheless, you can decide whether baby jumper use is good for your baby or not. 2. When is the best time to place your baby in a jumper? All baby jumpers come with a manufacturer recommended age and weight limit, make sure your baby is within this limit. However, most parents place their baby’s in jumpers as soon as they can support their head unassisted. 3. How is a baby jumper different from a baby walker? Baby walkers are mobile and allow your baby to move around when in a sitting position while baby jumpers allow your baby to bounce up and down in a while in a stationary position. I hope this article gives you enough insight into the use of baby jumpers and how to choose the right one for your baby. The variety of baby jumper designs give you a choice in style customization. The jumpers reviewed above are perfectly designed to keep your child having secure fun and will help you make an excellent choice and you can easily pick the best baby jumper for your baby . Get your baby up-about and giggling by getting that baby jumper today!